Haga clic en el enlace de arriba para traducir esta página al español. Below are quick links for the topics in our handbook. If this is your first time viewing the handbook we recommend either scrolling through or downloading a copy so you do not miss anything. If you would like a printed copy please let your child's director know. ALL families are asked to submit the handbook acknowledgement form found at the bottom of this page. The best way to contact the Band Staff is through email as we are in the classroom and away from our phones the majority of the day. If you or your child has a serious concern, we would encourage you to set up a conference so we can work through the solution face-to-face. We always do our best to return your e-mails within 24 hours. Feel free to call us, but since we have very limited conference the best way to reach us will always be email. Band Website: www.staleyBand.org This is THE BEST place for current information! Contact regarding all high school info if you will be attending Frisco. Contact regarding all high school info if you will be attending Memorial. The Staley Band has three categories of grading for all band members. Families are encouraged to monitor your child’s grades (in all classes) and let us know if you have any questions. This category includes any written or playing test for ALL Band students. This is the largest portion of our grade as our preparation has the largest impact on our success. Beginning Band assignments include: written tests, binder checks, weekly playing tests, vocabulary tests, and concert reflections. Advanced Band assignments include: weekly sectionals, written tests, binder checks, playing tests, vocabulary tests, and concert reflections. This category includes any REQUIRED PERFORMANCE (including any rehearsals related to those performances). While our performances will only account for 30% of our overall grade, we typically only have one or two performances within a grading cycle, meaning any student who receives a zero will automatically be in danger of failing for the six weeks. Beginning Band events in this category include: October Concert, December Concert, February Concert, May Concert, Spring Solo Concert, and the Spring Audition. Most concerts will include at least one rehearsal which will count as a separate minor grade. Advanced Band events in this category include: October Concert, High School Combine Night (must attend one of the two), December Concert, All UIL Clinics, All UIL Performances (including Pre-UIL), May Concert, Solo & Ensemble Contest, Semester Auditions, and any other performance throughout the year that the Band staff communicate as ‘Required’. This category includes both a weekly material/participation grade and the progress journal that is checked every three weeks. While this section only accounts for 20% of the student’s overall grade, if students do not come to class prepared major grades could suffer. Make sure to have all required items and practice on your own! Questions over a grade? Contact your child’s director– please note that directors only have access to the classes they are listed as the ‘teacher of record’. If you are not sure who teaches your child’s class please log on to the Home Access Center (HAC) to review or email Mr. Wood and he will forward your message if needed. Band includes activities that are both curricular and extracurricular. To participate in any event or activity that is extracurricular students must be eligible to compete. To be academically eligible students should be passing ALL classes at the end of the six weeks. If students are not passing a class they will have an opportunity to regain eligibility by passing all their classes (not just the one they failed) on their three week progress report. 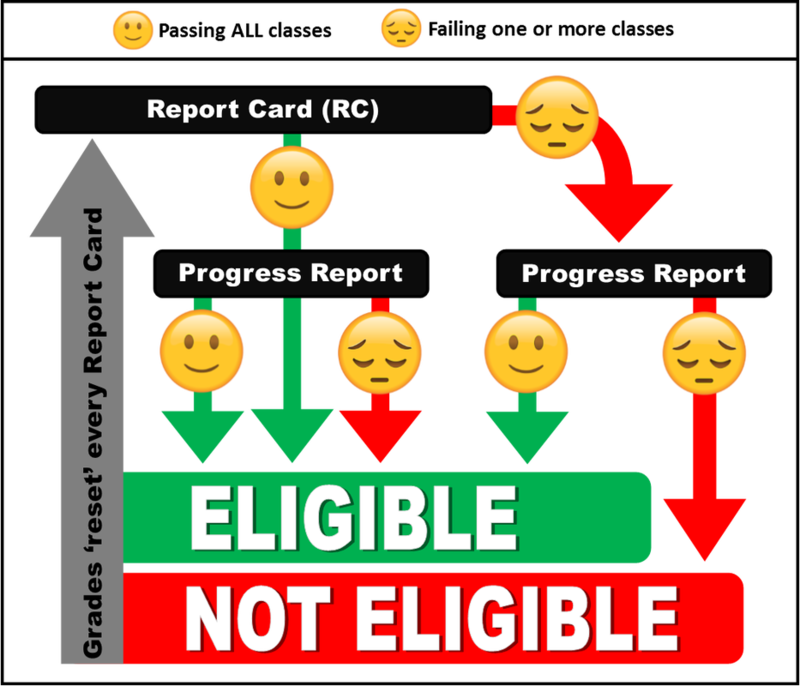 Note that students who pass all their classes on the report card cannot lose their eligibility based on failing progress report grades. Extracurricular events (students must be passing to participate) include: All-Region, solo contests, Band competitions, UIL events, football games, and any event involving travel. Curricular events (students will participate even if failing a class) include: Concerts at Staley, All-Region master classes, UIL clinics, sectionals, and any other event held at Staley. Reward Trips/Parties: Only students who are passing ALL their classes will be allowed to attend. Band students are evaluated, monitored, and assessed daily in band. Most of the time in class directors will just offer feedback and tips for improvement. Many other times there will be more formal assessments including playing tests, pass offs, and auditions. Playing Tests will be entered into the gradebook and will typically take place once a week for most band students. In many cases students will take these tests playing ‘down the row’ in front of their peers, but we will also offer students to perform individually for staff or even upload playing tests to Google Classroom. ALL of our tests are for a grade and we DO NOT assign chairs or rank the students. Pass Offs are for students to demonstrate required skills to the band staff. These assessments will not show up in the grade book. These lines are set up to be either PASS or TRY AGAIN as students who do not succeed will need to practice more and attempt the skill again next time. Auditions are end of semester or end of year skill based assessments. Our advanced bands are set up as performance based groups and based on how well students perform, not the grade they are in. All students are required to audition and results will posted alphabetically by band (again, we do not rank the students within each group). Students enrolled in Honor and Symphonic band are required to attend one sectional per week. This is our only time to work with small ‘like instrument’ families. When: Students will set the schedule with the band staff to try to find a time with the least amount of conflicts. Since our students participate in so many activities this can be difficult, but the band staff will work directly with our coaches and teachers to ensure that there are minimal issues. Sectional Times: Sectionals before school are from 7:30-8:15. Students should plan to arrive by 7:20 so they have time to uncase and warm up before the start. Sectionals after school are from 3:45-4:30. Students should try to arrive in the band hall by 3:40 to uncase and start warming up. Grading: Sectional grades are based on attendance and having your music prepared. Attendance: Sectional attendance is mandatory for all Honor and Symphonic Band students. Students who miss more than 25 minutes, are not prepared, and/or distracting to other students will be dismissed from sectionals and receive a zero in the gradebook. Tutorials/Excused Absences: We will always work with students so they can attend academic tutorials, athletic games, or other school events. To help us stay organized please let us know as soon as possible if you will miss part or all of a sectional. Teachers are required to provide before and after school options for tutorials/make-up grades. Whenever possible, please try to attend tutorials at a time that does not conflict with the weekly scheduled sectional. Morning tutorial students should report to sectionals and pack up at 7:45 and return the band tutorial pass later that day. Afternoon tutorial students should come to the band hall to remind the band staff where you are, take a band tutorial pass, and return it when you come back to the band hall either later that afternoon or the following day in rehearsal. Athletics: We have a rich tradition of having between 70-80% of our band participate in athletics. We STRONGLY encourage all our students to ‘try everything’ in middle school so you can really find what your passion is before high school (obviously we hope it is band!). We will work with the coaches to work out a schedule so you can attend all events necessary. Students will never be placed in the positon where they have to choose between band and other Staley activities since the directors will always reach out to the sponsors/coaches to help find a solution. Athletic games take priority over sectionals and we will work out a dismissal time (or excuse you all together) based on coaches recommendations. Transportation: If your child has transportation issues with an assigned sectional time please let us know as soon as possible so we can help find a solution. Again, we stress that we prepare for weeks for every performance and any student who has an unexcused absence from a performance will be in danger of failing Band for that grading period. Most group performances will begin at 6:30 and last about an hour, but times vary depending on the number of groups performing. Some individual performances (Solo Contest and All-Region) will allow for personal time frames and will not be assigned until two weeks before the contest. Please reserve the entire contest block in your schedule and we will communicate your child’s time when available. Students will need to arrive early to warm up before all performances. In general, the ‘call time’ for the musicians will be thirty minutes before the concert begins. All performances are free to the public, although some performances might feature an optional fundraising event before or after the concert. Band students are judged not only on how they play but also on appearance. We strive to not only as one but to present a unified look whenever possible. Concert attire will be outlined on the specific web page for each event. ‘Pep Band Attire’: Blue Band t-shirt, jeans, and tennis shoes with any color socks. ‘Concert Black Attire’: black performance polo, black dress pants, black socks, and black closed toed shoes. Please try to refrain from any other colors on your shoes. Note that flip flops, white socks, jeans, or shoes with less than 80% black on them will result in a lower grade. Concert attire: Beginning Band is all about learning our instrument. Since our main focus in in class our performances will always include our Blue Band T-shirt, Jeans, and any type of closed toed shoes (no flip flops). Solo Contest: Students are invited to dress up for their individual performance, but are also welcome to wear their band t-shirt and jeans. If you choose to dress up young ladies need to be sure that their dress/skirt goes just past the knees when sitting down. Young men should wear dress pants, a long sleeve button up shirt with tie, and dress shoes. Ladies should wear a long dress (past the knees) or dress shirt and skirt (past the knees). Ladies who cannot find a long enough dress are encouraged to wear dress pants. Families who cannot meet the required dress should let the directors know in advance so they can work out a solution. Also– we are happy to accept gently used black dress pants and black dress shoes of all sizes (boys and girls) that your child has outgrown! Performances are live events that cannot be made up. Every Band member works daily towards our goals and every member of the ensemble is vital to our success. If your student needs to miss a performance they will need to let their director know via the ‘Band Absence Request Form’ found on our website (hard copies are also available in the band hall) at least twenty four hours in advance for rehearsals and two weeks for performances. This will allow time for the Band staff to reassign music if needed. Families are encouraged to check our calendar and website regularly and contact the Band staff immediately if you see any conflicts. Students who have an excused absence (or family emergency) are still required to fill out the ‘Performance Absence Request’ when possible. We understand that in some circumstances you will not be able to communicate prior to the missed event. If this is the case please be sure to send your child with a note (or email) when your child returns to class. We do not want to put undue burden on your child by asking why they missed a major event if there was a sensitive family emergency. Students who were at school the day of and the day following the missed event. Please bring a doctors note if you were told by a physician not to attend one of our events but were allowed to attend school. Any missed event without prior communication will result in a lowered grade, loss of privileges, and/or reassignment to a different part or role within the Band, including the role of spectator. If students miss multiple events they may be moved to a lower Band or asked to leave the program. Many times circumstances may be out of the student’s control, so communication between the adults is key. Thank you for checking the calendar and website often. Thank you in advance for being proactive in your communication with the Band Staff regarding all Band events on the calendar and website! Be sure to refer to the website for the most current information. Your child’s success in Band is a reflection on their participation in class and the amount of QUALITY practice time spent outside of class. It is through consistent practice, goal setting, and reevaluation that students develop and achieve success in their musical ability. All Band Students are required to keep track of their practice time throughout the year. To make this easy we provide two options to log practice. Students can use a QR code we provide to log individual practice. Since many students have a personal device this can be a seamless process if they are already using their a tuner, metronome, or timing app when they practice (which we recommend!). Students who choose this method do not need parent verification as there will be a date and time stamp on our spreadsheet with the student’s data. Students can use a hard copy of the PJ that contains rows of boxes. Students simply cross off a box for every twenty minutes they practice. We ask that parents sign to validate their practice once every three weeks. This is done primarily as a communication tool as opposed to verify every minute practiced. If your child is showing you that they practiced sixteen hours at home but you have not heard anything, please ask them about it. Likewise, if your child is practicing on a regular basis but you never see a PJ to sign please ask them for it. If students practice the recommended twenty minutes six days a week they will receive an ‘90’ in the gradebook. This daily grade is based only on overall minutes practice within the three week period. Since we have no way to verify PJ minutes, this grade will only be taken twice within a grading cycle and account for 20% of the overall grade- meaning a student who never logs any time could still potentially make an 80 in band. That being said, students who are not playing regularly outside of class will likely not perform as well on their playing and counting tests– which accounts for 50% of their overall grade. Students will receive one participation grade every week in Band. This is based on having all materials needed in class and student participation. This grade is automatically a 100 in the gradebook at the start of the week and is only deducted if students refuse to participate in class or are missing one of their required supplies. Student participation deductions are on a case by case basis and the Band staff will follow the campus plan regarding discipline. If a student is having their grade lowered due to refusal to participate we will communicate directly with the student and parents before any changes are made in the grade book. Since directors rarely have problems with students not wanting to participate, this participation grade is rolled into the weekly material grade. Instrument* and all parts needed to play (mouthpiece, reed, mallets, etc.) *-20 points! Students who do not have one of the items above will lose ten (10) points off of their weekly participation grade with the each day they do not have them throughout the week. Students who forget their instruments will lose 20 points off their weekly grade as they not only are missing a necessary material, but will also be unable to fully participate. Directors may not check every item every day, but this grade is cumulative throughout the week. For example, if a student forgets their pencil on Tuesday they have a 90. If they forget their instrument and binder Wednesday they have a 60 (-20 for the instrument, -10 for the binder, and the previous –10 for the pencil). At the end of the week the grade is updated and the following week the students begin the new week with a 100 again. Note that students who regularly forget their instrument will be asked to call home and may be assigned a lunch detention. This grade also includes any rehearsals or sectionals that take place outside of the school day. Students who regularly do not have items needed in class (three failing participation grades in a row) will have a conference with the Band staff and a parent. If your child is missing something due to something out of their control (like you were not able to make it to the store to buy more reeds) please send them with a note so we are aware of the situation. Special circumstances regarding materials will be handled on an individual case by case basis. If you are unable to get the needed supplies please let us know so we can assist. Students should be in their seat with all materials when the FIRST bell rings. Once the first bell rings students should be silent, even if they are still assembling. Advanced Band members are encouraged to ask for help from the assisting director by raising the ‘thumbs up’ sign. This can be for individual help, instrument concerns, or missing materials. Every rehearsal ends with stands being pushed down for the next group. Some periods may also be asked to assist with setting up or breaking down the Band hall. Every member of the class is expected to participate in getting the room prepared. In addition to grade reductions, Students who regularly do not meet ensemble expectations may be assigned to observe performances (sit in the audience instead of playing their instrument), re-assigned to a lower Band, or asked to leave the Band program. Any participation concerns will be communicated to parents well before any of these actions take place. 1) Dress appropriately for the performance. Any indoor concert is meant to be a nice event. a) Performers are NOT ALLOWED to have a cell phone during a performance. b) Audience members should Silence all cell phones. c) Avoid texting during a performance. d) If you are video recording during a performance be mindful of those behind you. 4) Refrain from talking while the director is on the stage. 5) Only enter or leave the seating area during applause. If necessary, close the door quietly. 6) Do not take flash photographs while the group is playing (before and after is fine). 7) Crying or fussy children should be taken to the lobby area. Only applaud at indoor performances– yelling or whistling isn’t appropriate in a concert setting. It is appropriate and polite to applaud as the conductor approaches the podium. Do not applaud for soloists during a full Band concert performance, however, it is appropriate to applaud for soloists during a Jazz performance. For an exceptional performance, it is always appreciated when the audience stands in applause following the final selection (standing ovation). Many students/performers have their own devices. We encourage performers to act responsibly. Rehearsals: Students MAY have their phones out during band if they are using a metronome or tuner app. When students are not using these tools the phone should be face down next to their chair. If you cannot resist the urge to check your feeds/texts do not use a phone in class as the directors will collect your phone and take it to the office for you to pick it up at the end of the day. Concerts: Students MAY NOT have their phones during performances. If they bring their phone they should leave it in their case when they assemble their instrument. If they are worried about leaving their phone behind they can turn it off and give it to their director or just not bring it. The Band Hall is a great place at Staley! Many students spend a great deal of time in the Band hall and it feels like their ‘home away from home’. While the Band staff enjoy having students in the Band hall (especially if they are practicing!) there are guidelines that must be followed. Band Hall Hours– The Band hall is open by 7:30am and closes by 5:00pm. Students are welcome to use the facilities any time a Band director is present. Practice Rooms- Students are encouraged to use our practice rooms! If the rooms become too busy we may ask students to sign up ahead of time. Please remember that private lesson teachers or Staley music staff may ask a student to give up their room at any time for any reason. If you cannot find a place to practice ask a director for help. Note that there should NEVER be one boy and one girl in a practice room alone. Before School: When students arrive to school they should drop their instrument off in the band hall before reporting to the café/gym. Boys athletics should go directly to practice and you will have a chance to drop off your instrument after your athletic period. Only students who have a morning sectional should use our external door before school. After School: Students should visit their locker first and then come to the band hall to get their instrument. Our exterior door is OPEN at the end of the day and students are all encouraged to exit directly outside after getting their instrument. All students are expected to take their instruments home EVERYDAY! If you have two instruments (that are not assigned by a director) please let your child’s director know as we check the instrument cages every day before we leave. Girls athletics should come to get their instrument before they go to athletics as the band hall may be locked once your practice ends. Chairs and Stands- Students should not move chairs or stands unless they have permission. To help the Band staff we ask that all students push their stand down when they are finished using them. NEVER write on a stand or use a stand as a desk. Office Areas- Students are not allowed in the band office, storage area, music library, or repair room without permission. This includes Mr. Wood’s desk in the Band hall. Instrument Cages- Cages are used to store instruments and Band binders. Items that should not be in the cages include; food of ANY kind (including lunches), library books, trash, and other students. All cages should be closed and locked when not in use to avoid injury to other students as well as protection of their supplies. Students who do not meet these rules will lose points on their participation grade and can lose cage privileges if no improvement is shown. Cage Locks– Students are supplied a lock at the start of the year. You are allowed to bring a personal combination lock for their instrument cage, but must give the directors the combo BEFORE placing it on your cage. Note: lost band locks are subject to a $30 replacement fee as they are a complete set. Band Hallway- the hallway leading to the Band hall is one of the busiest places in all of Staley! To help traffic flow students are asked to stay on the right side of the hallway and carry any instruments or school supplies in front of them. Students are also asked to not stop and talk to their friends in the hallway. Non-Band Students- Students not enrolled in Band are not allowed in the Band Hall unless they have a directors permission. If you travel home with a non-band friend they should meet you outside next to our exterior door after school. This is to protect our instruments and help the Band staff monitor the room. Band students who bring their non-Band friends into the Band hall may receive a deduction on their weekly participation grade. Help keep our facilities as nice as possible! We are the original and there is no other band hall/stage like ours in the entire district! Every Band member is required to pay a ‘fee’ at the start of the year. This fee covers expenses throughout the year that the district does not cover. The Staley Band Staff strive to make band affordable and fun for everyone by continually having the lowest fees in the district. Form 1– Band Fee: This is our fee to cover operating expenses not provided by the district. Instead of asking you to send $3 here and $2 there, we roll everything into one $30 sum. If your family is enrolled in the FISD Free and Reduced Lunch program you are asked to only pay $15. Form 2– Uniform Fee: Band students have one of two uniforms they will be asked to wear at every performance. 1) The T-shirt is for all band members and is the same each year. Returning members are welcome to wear their shirt last year if it still fits and is in good shape. T-shirts are $10 each and $5 if your family is enrolled in the FISD Free and Reduced Lunch program. 2) The black performance polo is only for members of Concert, Honor, and Symphonic Band. Returning members are welcome to wear their polo they had last year if it still fits and is in good shape. Polos are $22 each and $11 if your family is enrolled in the FISD Free and Reduced Lunch Program. Form 3– SMSBPA Enrollment: The Staley Middle School Band Parent Association (SMSBPA) is our booster organization that comes along side the band staff to offer additional support to the program. There is a $10 membership fee (no free and reduced discount as this fee is optional) and we encourage all families to not only join, but look for ways to volunteer and get involved! Students who play a school owned instrument (typically Oboe, Bassoon, Tenor Sax, Bari Sax, Horn, Euphonium, & Tuba) have a $100 usage fee that can be paid at the start of the year or broken into two $50 installments at the start of each semester. This fee will provide you with an instrument to use for the school year and through summer (unless you are moving up to high school). Note that any damage outside of normal wear and tear is still the responsibility of the family using the instrument. Your director will give you the paperwork if needed. If you are enrolled in the FISD Free and Reduced Lunch program we ask that you pay $50 at the start of the year or two $25 payments at the start of each semester. Follow us! The Staley Band is going to have an active social media presence. Please be sure to follow or like us @StaleyBand or #StaleyBand on Facebook, Instagram, and Twitter. We also encourage you to help spread the great things your students are doing! Be sure to tag and share #StaleyBand and @friscofinearts when you attend one of the many events in Frisco ISD. Pictures of our students will be appearing on our feeds. We will follow the district guidelines and be sure to NOT post any photos of families who have opted out of all directory information, but if you would like us to NOT include your child in any of our posts please let us know as we will do our absolute best to honor your wishes. Contact us directly if you would like us to not include your child, otherwise we will follow the district guidelines. We will be using Google Classroom as a tool to help our students submit assignments, view class announcements, and stay organized. All students are required to sign up for their band period class and all parents are encouraged to join (you will be able to view only). Please let us know if you have any questions. Band is a curricular course that had many additional events and activities throughout the year. In order to provide the financial resources for these activities, the Band participates in one major fundraising activity in the fall. All money raised is used to directly benefit the students in the Staley Band program. For those who are interested, donations are gladly accepted in lieu of participating in fundraiser. More information about fundraising procedures will be sent home at the start of our fundraising drive at the end of September. In addition to the major fundraiser the SMSBPA sponsors, there will be multiple events meant to help raise funds for the Band. All parents are encouraged to volunteer at least once this school year. We cannot make all these events happen without you! In many cases there is great parent involvement at both the elementary and high school and a drop off for middle school. We hope to avoid that and keep everyone active in some of the most important and formative years of your child’s education. Some of the most beneficial ways are listed below. Donate your time: we have football concessions, performance monitors, trip chaperones, and many other ways you can help! This is THE MOST valuable resource we need. Gift cards: our BPA can use gift cards to purchase food, instrument supplies, and many other necessary things throughout the year. This helps ease our operating costs and any amount is greatly appreciated. Most common places include: any music store, Costco, any office supply store, home depot. Donate Consumables: Colored paper reams, pencils, music supplies, etc. Personal Sponsorships: You can purchase supplies for a student or even sponsor a child for private lessons for the year! Contact a director for more information. Corporate Sponsorships: If your company would like to sponsor the Band please let us know! There are many ways companies can help between donations, matching funds, or sponsoring an event. We will gladly put your information on our programs and website! Boxtops for education: We will gladly accept your boxtops! Send any clipped boxtops with your child to turn in on a weekly/monthly basis. Amazon Smile: If you shop on Amazon- use THIS LINK to have a portion of your profit donated to the Staley Band. You will need to log in again and confirm that you would like to select the Staley Band Parents as your 501(c)3 non-profit selection. Be sure to bookmark this link- it is an easy way to help us out- spread the word! More ways are always being developed! If you have an idea to help– please let us know! We will be updating our social media feeds at least once a week. We will be sending weekly ’Band Notes’ via email at least once every other week. If you do not receive emails or would prefer to receive them on a different account please let us know. In addition to these five elements, our most valuable communication tool is our students! Please ask them regularly what is going on. Typically we will discuss upcoming events on a daily basis as they get closer. If they are not able to communicate what is going on in band please let us know as this is a valuable skill they will need to learn before high school and we are happy to help them learn strategies to get organized and communicate effectively. Don’t forget to fill out the Band Absence Request Form if you are (or were) absent or missed an event. This can be found on the individual event page (#3 above) and also be sure to look at the ‘Conflicts and Absences’ section of this handbook. With regards to calendar, please be aware that major dental work before a performance could greatly affect your student’s ability to participate. Your child plays a vital role in the ensemble and we need 100% attendance in both rehearsals and concerts whenever possible. We understand that sometimes this cannot be avoided, but if at all possible families are welcome to discuss the best times in the academic year to have major dental work. At the start of school we will work through the handbook, grading policies, and procedures with our students during class. Please take a moment to acknowledge that you have read and understand the policies of the Staley Band. If you have any questions feel free to ask Mr. Wood (woodc@friscoisd.org). It is going to be a great year and we are so glad your child has chosen to be in band this year. We thank you in advance for your support and look forward to great things! By typing your name and choosing 'yes' below you acknowledge that you have read and understand the policies and procedures of the Staley Band (including performance requirements, grading procedures, and eligibility).